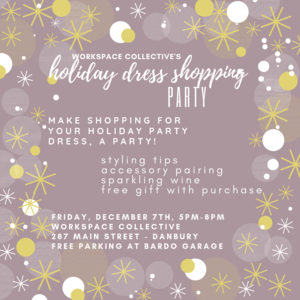 Holiday Dress Shopping Party in Danbury on Friday! Make shopping for your next holiday dress party, a party in itself! Stop by Workspace Collective where we carry thoughtfully made fashion and accessories, all artisan made, handmade and sustainably made. We will provide you with styling tips, pair your dress with the perfect accessories while sipping on some sparkling wine and receiving a free gift with your purchase. Plus, get your photo taken so you can see how your look will come together! Friday, December 7th from 5PM - 8PM at Workspace Collective. Located in the @287 Gallery at 287 Main Street in Downtown Danbury. Park in Bardo Garage and we will comp your parking for the night!